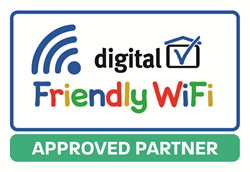 SafeDNS strengthens its collaborations with Friendly WiFi, a UK government-initiated safety certification for public Wi-Fi, and secures a status of Friendly WiFi Approved Partner. This partnership brings SafeDNS customers new opportunities and confirms once again that SafeDNS fully meets Friendly WiFi requirements in providing a reliable and efficient web filtering service to owners of public Wi-Fi hotspots and wireless ISPs, schools and the hospitality industry. SafeDNS filtering solutions are indispensable for protecting staff, clients, visitors and guests – especially young ones – against advanced web threats, inappropriate online content, botnets, malicious and phishing resources. For Wi-Fi providers and business the Friendly WiFi Partner status proves that SafeDNS customers' wireless network users are under a high quality protection against cyber threats. This is all the more important in areas and public venues where children are present. SafeDNS technology powered by machine learning is processing DNS requests in a quasi-real-time mode to identify infected hosts and provide a threat protection service. Approximately 24.7% of Wi-Fi hotspots in the world do not use any encryption at all. 75% of consumers don’t use any instrument to secure their Wi-Fi connections, 87% of consumers have potentially put their information at risk while using public Wi-Fi. To minimize these risks SafeDNS creates and constantly refines its filtering products. Large UK Wi-Fi and IT solutions providers as Yo Wireless, EvolveODM, BuildingZones have already chosen the SafeDNS solutions to safeguard their customer from cyber threats and unwanted content. SafeDNS looks forward to seeing this cooperation with as a positive acknowledgment of the company's expertise. With SafeDNS public Wi-Fi owners and providers can get their wireless networks certified by Friendly WiFi with 10% discount. Owners of the certified networks are eligible to use and display a Friendly WiFi symbol at their venues, use the electronic symbol on their Wi-Fi landing pages, websites and marketing materials. This symbol means that public Wi-Fi is safe for children and meets necessary web filtering standards. SafeDNS welcomes owners and providers of public Wi-Fi to get Friendly WiFi certification. Go to the dedicated web page for information on how to get public Wi-Fi certified. The SafeDNS solutions for web filtering and internet security are available to customers as a paid service. To learn more about these solutions, pricing and other information, please, contact SafeDNS at sales(at)safedns.com or call +1-800-820-2530, +1-571-421-2990 (outside US). SafeDNS is an Alexandria, VA, US based company, worldwide provider of cloud-based web filtering and internet security solutions as well as threat intelligence services. In 2013 the company launched a commercial version of its web filtering service for home, educational and corporate users. In 2014 SafeDNS released its web filtering platform for ISPs and mobile operators. The SafeDNS filtering servers are located throughout data centers in Europe, Australia, North, Central and South America. Every day the company processes about a billion queries from users of its filtering service. Now the SafeDNS products and cloud service are used by more than 300 telcos, 100 partners, 4000 organizations, tens of thousands of home users, and about one million of anonymous free users worldwide. The top quality of the SafeDNS web filtering service has already been acknowledged by world leading test labs and publications. In February 2016 SafeDNS became Editor’s Choice for Content Management & Filtering Solutions in 2016 Cyber Defense Magazine Infosec Awards. Last December PC Magazine included SafeDNS into a list of the best parental control software for 2018. This July as well as for 3 previous years the service was named Approved Parental Control Product by AV-Comparatives. Learn more about us at safedns.com.